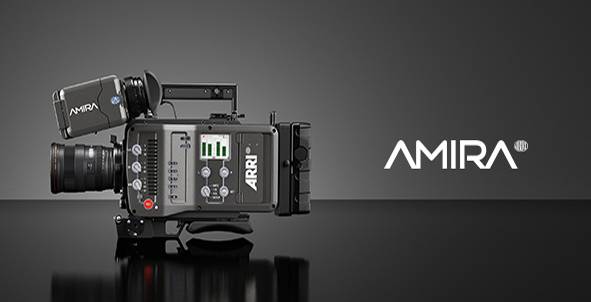 ARRI proudly introduces AMIRA Advanced, a versatile documentary-style camera that combines exceptional image quality and affordable CFast 2.0 workflows with an ergonomic design optimized for single-operator use and extended shoulder-mounted operation. Ready to pick up and shoot straight out of the camera bag, AMIRA is hardy enough to take anywhere and features in-camera grading with preloaded 3D LUTs, as well as 200 fps slow motion. It is suitable for a great variety of production types, from reportage and corporate films to TV drama and low-budget movies, so wherever you are headed and whatever you need to shoot, let AMIRA be your companion. AMIRA features the same sensor and exceptional image quality as the ARRI ALEXA, recording superior HD 1080 pictures that are suitable for any distribution format. With a dynamic range of more than 14 stops, low noise levels, subtle highlight handling, natural color rendering, breathtaking skin tones and speeds of up to 100 fps, AMIRA will deliver beautiful, life-like images in any situation. AMIRA boots up quickly and can be used straight out of the bag by a single user, with no setting up, no rigging and no delays. Sliding dovetails allow the camera to be perfectly shoulder-balanced for comfortable handheld shooting, while the innovative multi-viewfinder combines a high resolution OLED eyepiece with a fold-away LCD monitor that provides both a live view and full access to camera functions. Uniquely, AMIRA comes with a number of 3D LUT-based looks that can be applied while filming. The pre-loaded LUT feature essentially amounts to in-camera grading; it allows cinematographers to craft a consistent, identifiable visual approach, even on small- scale productions that cannot afford to pay them to attend the grade. Documentaries, dramas and commercials often involve a number of contrasting looks for different narrative or thematic elements. With AMIRA these looks can be either ‘burned in’ to the recorded footage or used purely for monitor imaging. Either way, they give cinematographers and directors a greater degree of creative control on fast-moving productions, while keeping costs down for producers. Like all ARRI products, AMIRA is designed to be a safe, long–term investment and built to withstand the rigors of life on a professional set. One of the reasons why ALEXA has been accepted so widely all over the world is that its build quality is significantly higher than competitor cameras, and the same is true of AMIRA. allows the graphical user interface (GUI) on AMIRA’s LCD panel to be displayed live on a device, such as a smartphone, tablet or laptop, that is connected to the camera via Wifi* connection or an Ethernet cable. The user interface exactly replicates the camera’s home screen menu, much like the AMIRA Simulator web tool. Temporary licenses allow AMIRA shooters to purchase and download specific features for a specific job at the online ARRI License Shop. AMIRA Premium licenses can be activated on a weekly basis, providing a uniquely adaptable solution for the variable needs of owner-operators. With the EF mount, AMIRA users can benefit from the huge range of available EF mount stills lenses, electronically controlling the iris in these lenses through the camera’s user interface. B4-type lenses with an integrated servo module gain support for the auto iris function, while one other servo button can also be used as an assignable user button..
AMIRA’s HD-SDI outputs allow the overlay of information about timecode and other parameters that is seen in the viewfinder, to also be seen on monitors. Additionally, it is also possible to use an HD-SDI signal input as a further ‘genlock-like’ sync option. ARRI’s Lens Data System® (LDS) comprises a range of products generating highly accurate lens metadata for use on set and in post. When using an LDS lens on AMIRA’s LDS mount, lens data about iris, focus and zoom positions is visible in the viewfinder and all lens data will be embedded in the recorded QuickTime files. Features additional to the AMIRA Advanced: 2K (2048 x 1152) and ProRes 4444 recording; import custom 3D LUTs. AMIRA PL LDS lens mount for PL mount lenses. Includes 12pin Hirose connector for ENG style lenses. For more details, click here. AMIRA B4 lens mount with optical, mechanical and electronic interfaces for B4 mount lenses. For more details, click here. AMIRA EF lens mount with interface for iris control. For more details, click here. A mechanical and optical adapter that allows the use of B4 mount lenses on cameras with a PL mount. For more details, click here. An additional USB stick (each AMIRA camera includes one). For more details, click here. The viewfinder is included in the AMIRA K0 camera packages and does not need to be ordered separately when ordering a K0 camera package.For more details, click here. An adapter with an ARRI viewfinder dovetail on one side and one 3/8″ and one 1/4″ mounting point on the other side. For more details, click here. An attachment that allows the AMIRA viewfinder to be mounted to two 15 mm lightweight rods above the lens. For more details, click here. Single-axis wireless hand unit for iris, focus or zoom control. Works with ALEXA Plus and Studio cameras and UMC-4, SMC-1 and EMC-1 motor controllers. For more details, click here. ARRI Pro Camera Accessories complement the Documentary-style camera, offering a wide range of solutions for applications such as handheld broadcast, camera stabilizers or heavyweight studio filming. For more details, click here. ENG style camera base mount with highly ergonomic shoulder pad and wedge plate adapter.For more details, click here. A camera base mount compatible to accessories like BP-8/BP-9 for 19/15mm rods etc.For more details, click here. Universal Adapter Plate UAP-2 with 15mm rod mounting receptacles. Attachable to the dove tail on top and bottom of AMIRA.For more details, click here. Compatible with AMIRA, counterplate for the WPA-1, to be mounted on the tripod head.For more details, click here. Shoulder belt offers the compatible with standard ENG shoulder belts.For more details, click here. Bracket to attach a on-camera microphone to the camera handle. Includes 3/8′ and 1/4′ knurled fasteners. For more details, click here. AMIRA camera case (Peli 1510 carry on case, cabin size, foam fitted for AMIRA & MVF, ARRI AMIRA branded). For more details, click here. ARRI branded Peli 1510 Carry On case for accessories, cabin size with flexible dividers. For more details, click here. ARRI AMIRA branded soft carry bag. For AMIRA camera with MVF-1, camera adapter and zoom lens. For more details, click here. Proven camRade raincover to protect AMIRA against heavy rain and more.